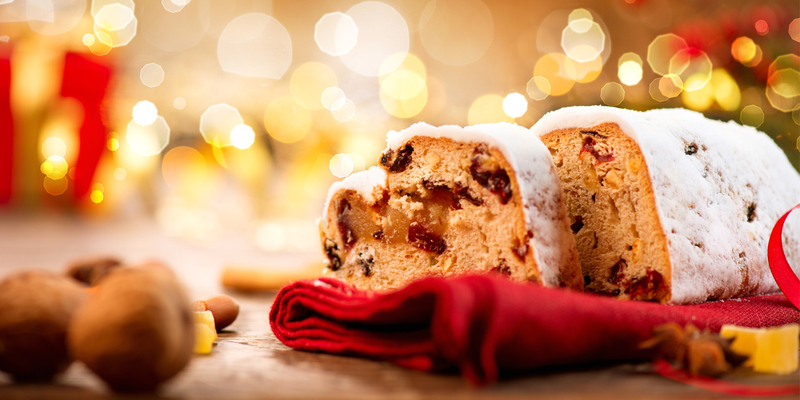 Celebrate the holidays with a macrobiotic stollen recipe from Eden Foods. Combine mirin and raisins. Set aside to soak. Warm the EDENSOY, oil and sweeteners together in a sauce pan. In a food processor, combine warmed liquid with 2 cups unbleached white flour, nutmeg, cinnamon and yeast. Place in a mixing bowl. Drain the raisins. Place the soaked raisins, almonds and pastry flour in the mixing bowl and fold in. Allow to rise, covered with a damp towel, in a warm spot for 1 hour. Divide dough into 2 balls, shape into crescents and place on an oiled baking sheet. Let rise an hour or so, until doubled in size. Preheat the oven to 375°. Bake for 20 to 25 minutes. Heat orange juice with soaked agar agar flakes, stirring constantly until the agar is completely dissolved. Add barley malt and mirin. Allow to cool slightly before pouring over the stollen.